The men and women who stepped in chains from the slave ships were musical people who were used to expressing intense emotions, beliefs, and ideas into song. Sold into hard work, poverty and oppression in America, they turned to songs for solace, singing of hardship and with passion, a tradition that had been long familiar to their race. Their songs summarized their beliefs of salvation, expressing in broken words the genuine spiritual realities of a world unseen, the world of Christian virtues: forgiveness, hope, faith, love, endurance, eternal life, holiness. 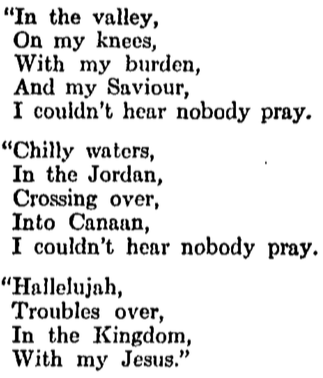 Although, how deeply the religious spirit permeated these songs is not always forthcoming. The same is to be said about a feeling of triumph heard through the songs. 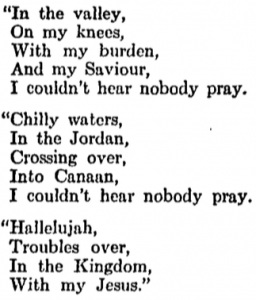 The lyrics from the song “I couldn’t hear nobody pray” are a good example of the text turning from mourning trials to an ultimate triumph. Spirituals became a solvent for a race’s healing from bitterness and pain, but also fed them with joy and determination. This entry was posted in Chloe Elzey and tagged Bitterness, Christianity, Hallelujah, Spirtuals, triumph by Chloe Elzey. Bookmark the permalink. Great job! Your writing is beautiful. I think there’s definitely more to be said about this topic. It might be interesting to see how the trials/triumph themes show themselves over time in music by black musicians. Gospel is probably a great example of these themes. Also, how do these emotions carry to the culture of the musicians? Do people who sing spirituals live life in constant positivity and hope? Beautifully written, C! I’m glad you chose to focus on one example of faith infusing song. I’m curious to know more about the song itself – do you have a sense for when it was written or first transcribed? The AABA structure of the chorus made me think of popular, Tin Pan Alley song rather than spirituals, although it’s possible that AABA is more common in spirituals than I realize. There’s also the question of the text – how exactly does it move from mourning to triumph? What’s the symbolism of being unable to hear anyone praying while praying oneself? And what’s the text’s relationship to the music? Is this a quote from a psalm, or is King’s article about something else? Anyway, all this to say that this is a great start, but clearly only the beginning of what could be done with a song and a primary source account like this. Looking forward to seeing the next post!